Agile Up-Sell/Cross-Sell module is a module that intends to increase sales by prompt products based on the products that the client has viewed or added his/her shopping cart. You can use this for both up-sell and cross-sell type of promotions. 2.A new setting tab "Up-sell" is added to your PrestaShop back office product detail setting pages. 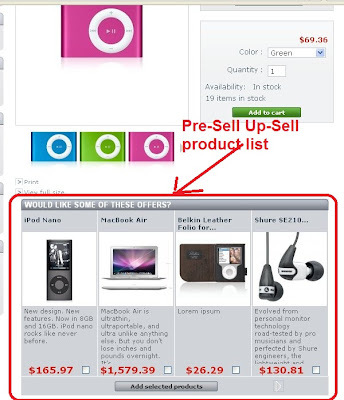 4.You can set p-sell/cross-sell for specific related product, i.e. up-sell/cross-sell products are associated specific product. 5.You are able to collect following the promotional statistics information for your marketing promotion analysis. 6.The presale up-sell/cross-sell product will be pushed out at product detailed page while customer tries to purchase a product. See below screenshots. 7.The post-sale up-sell/cross-sell products will pushed out on carrier/shipping selection page during checkout process. 1.At back end office, pre-upsell and post-upsell are defined for each product in an Upsell tab in the product section. 2.For each defined pre-upsell/post-upsell product, the statistics of the number times of clicks, number of people who purchase the products, and number of people who declines the product can be monitored. 1.The pre-upsell happens just after a product is chosen. 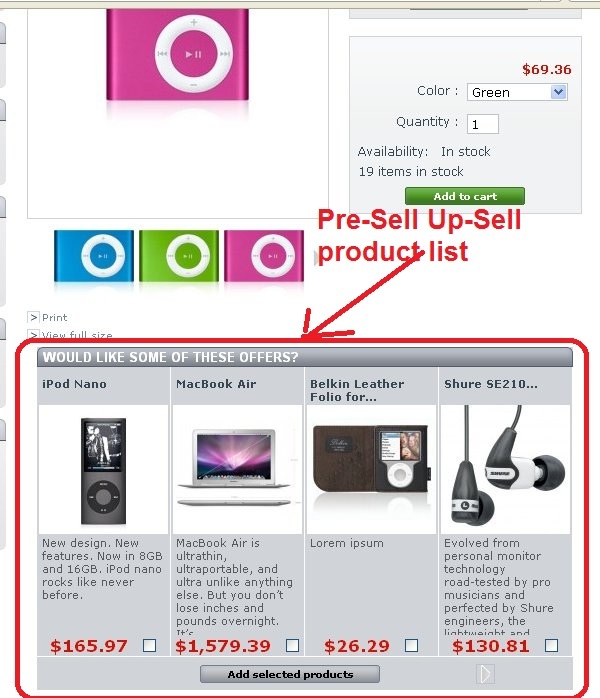 When the customer selects one product and enter the product page, the pre-upsell products will show below the main product's image. The customer can select any product to cart and continue shopping. 2.The post-upsell block shows the step "address" of the checkout process. It will show the pre-defined post-upsell products based on the products in the client's shopping cart. The client can add the selected post-upsell products to his/her cart.